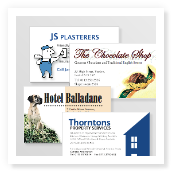 Choose a business card category for printing prices, print information and how to order. Fast turnaround low cost business cards. Full colour high quality matt laminated business cards. Custom bespoke shaped matt laminated business cards. Number one reason they are low cost to print. This makes business cards are a great way to cost efficiently promote yourself. However, it's important to take your business cards with you wherever you go and when the opportunity strikes, to hand the cards out. We specifically provide business cards holders for just for this job, the holder keeps the printed cards clean and in pristine condition. Use the colour printing process to the maximum as a colour business cards attracts more attention than a basic black and white card. 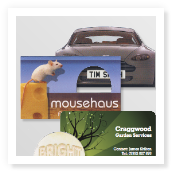 Why not use colour photographs of your products to make your card stand out further. 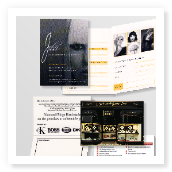 Double sided business card printing helps you add more information about yourself and makes the cards perform like a mini promotion leaflet. Adding prices to the reverse will convert the cards into an easily hand out price list. Printline Advertising is a business card printers in Leeds / Bradford. 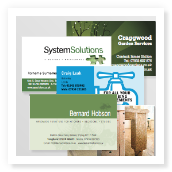 We have been printing business cards in Leeds / Bradford area since 1999.